Mike Campbell's 20th Shoot For The Cure Hoop-a-thon! Thank you for visiting my Personal Fundraising Page. Donating through this site is simple, fast and totally secure. It is also the most efficient way to make a contribution to our fundraising efforts. Many thanks for your support -- and don't forget to forward this to anyone who you think might want to donate too! Huntington's Disease (HD) is an affliction that affects 1 out every 10,000 Americans and touches the lives of many more people who love, care for and treat HD patients. HD is caused by a mutation on a chromosome which eventually leads to the death of cells in the region of the brain that controls movement and cognitive control. Symptoms vary from person to person, even within the same family. At later stages of HD, every individual affected by the disease requires full time care. That means that HD impacts more than the person affected; it changes life for family, friends, caregivers, medical professionals who treat the HD patient. I can't believe this is going to be my 20th Hoop-a-thon! I played some organized basketball growing-up at the Jersey City CYO, Bayonne YMCA, and Bayonne PAL along with countless hours of playground basketball. Playing on those asphalt and concrete courts took its toll on your knees while shooting on those baskets with just rims may have actually helped improve accuracy when you switched to playing with nets. My brother Tom and I often played together and we frequently played half-court 2 against 2 games. Tom was an exceptional player who at 6 foot, 4 inches and about 200 pounds often dominated with his strong inside game while I was an outside shooter. Tom could actually dunk the ball and had "hang-time" which was truly amazing! After not being involved much with basketball as an adult other than being a fan, I got back to basketball when my son Tom became old enough to play. I got involved with my local area's youth sports programs and coached basketball and baseball for several years. I also got involved with the annual NJ Hoop-a-thon for the benefit of the Huntington's Disease Society of America-NJ Chapter. Participants attempt to make as many free-throws as possible in 10 minutes while raising money to help find a cure for Huntington's Disease. 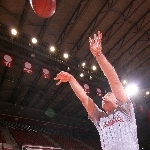 Shooting against the clock is exciting and simulates, to some extent, game conditions. At my 2nd Hoop-a-thon in 1998, I made 212 free-throws in 10 minutes and was the top shooter. At my 9th Hoop-a-thon in 2005, I set a new Guinness World Record for the Most Successful Free-Throws in 1 Hour thanks to the support of Mitchell Rait, Hoop-a-thon Chairman, and volunteers. I was later able to set another 4 Guinness World Records. This included another new record for the Most Successful Free-Throws in 1 Hour that was recognized by Guinness World Records as a 2007 Guinness World Record of the Year. I also appeared in the 2008 Guinness Book of World Records. At my 15th Hoop-a-thon in 2011, I made 273 free-throws in 10 minutes. I look forward to participating in my 20th Hoop-a-thon so please make a donation to this very worthwhile cause!